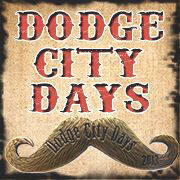 Roto-Mix is proudly sponsoring a few Dodge City Days events this year. Roto-Mix, along with Western Beverage, is sponsoring Thank a Farmer Day from 9:30 p.m. to 1:30 a.m. Friday at Central Station in Dodge City. James Wesley will be performing. On Saturday we’ll be in the Dodge City Days Western Parade. We’re also a sponsor of the Dodge City Roundup Rodeo, which starts next week. If you’re around southwest Kansas, come check out these great events!